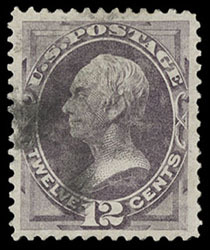 1870, 12¢ dull violet, cork cancel, strong vivid color, choice centering amid wide margins, Extremely Fine; with 2001 P.S.E. certificate. 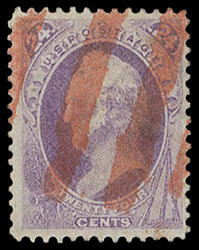 1870, 24¢ purple, red N.Y. Supplementary Mail cancel, uncommonly strong color and impression, Very Fine; with 1987 P.F. certificate. Weiss No. TR-G6. 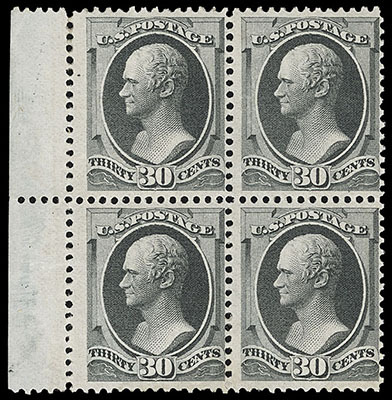 1870, 30¢ black, left margin block of 4, o.g., lightly hinged, strong vibrant color, very fresh, Fine and attractive; with 2019 P.F. 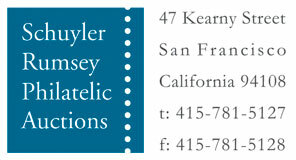 certificate for block of 6. Scott No. 154; $37,500 Estimate $4,000 - 6,000. A HANDSOME ORIGINAL GUM BLOCK OF FOUR THE 1870 30¢ NATIONAL BANKNOTE ISSUE. 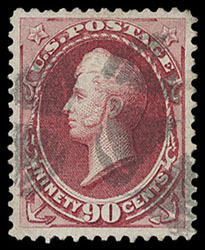 1870, 90¢ carmine, segmented circle of wedges cancels, rich bright color, attractive centering and margins, Very Fine and choice; with 1992 P.F. certificate.